In this case, there were three such “idiots” — Baranski, Merle Hiltner and myself. We all gathered three miles north of Norwood-Young America on the western outskirts of the metro area at the Onan Ob­ser­vatory, nestled within Baylor Regional Park. That’s what they call club events in which they invite members and the general public to come and observe the heavens through high-powered telescopes that, in some cases, have computers to guide them to the brightest and boldest objects in the night sky. After carefully examining the Clear Sky Chart on the Internet, Merle told me that the night of Tuesday, Feb. 8, was a good bet for optimal viewing. Everything needed for a great star show was there — cloudless sky, dim moon phase (crescent) and minimal light pollution. Unfortunately, these conditions would come with a hefty price tag — a minus-20 wind chill. Hence, Baranski’s reference to idiots. Another avid local astronomer has a similar description of those passionate about seeing the starry world under such brutal conditions. 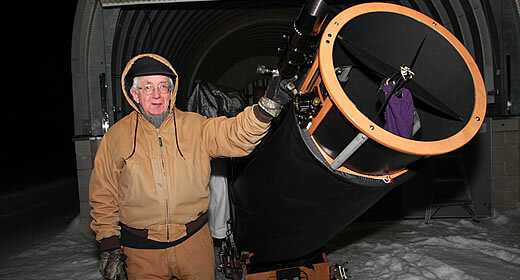 “Astronomers are crazy.” These are the words of Father Eugene Brown, who was the reason I found myself gazing through a telescope on that frigid night. A priest of the New Ulm diocese for 40 years, he is the editor of Gemini, a publication put out by MAS. Like Hiltner and Baranski, he, too, is a club member and avid astronomer. Actually, before going to Onan on Feb. 8, I had made two trips there the week before. Father Brown was there on both occasions, and had hoped to give me a view of the winter sky with a powerful telescope he had donated to the Onan Obser­vatory. But, on the first night, it was cloudy, and on the second, we experienced technical difficulties — among them, Father Brown’s chilled hands that quickly turned inoperable when it came to adjusting a telescope. Hence, he urged me to try again with a younger and more skilled astronomer — Hiltner. Still, this story is not complete without a spiritual perspective on star gazing from a priest who has always been fascinated by the endeavor and turned it into a full-fledged hobby within the last five years. As we prepared to brave the chill and observe the sky, I asked him how he connects his faith to his new avocation, which he has more time to enjoy now that he’s retired. “From the beginning of these five years I’ve been interested in astronomy, I’ve considered it almost a prayer looking through a telescope and learning about God’s creation and just marveling at the beauty,” he said. If Father Brown had any say in the matter, the Onan Observatory might have a crucifix on the wall instead of a large poster of the Orion Nebula. Yet, as I learned on that night, observing celestial bodies has a way of drawing the mind to the One who created them. After helping Hiltner and Baranski roll back the metal dome of the observatory, the show began. First up was a telescopic view of the moon far beyond anything I had ever seen. The 100-power telescope zoomed in tight on what’s called the terminator line on the moon, which is where it transitions from the day side to the night side. The angle of light created a detailed, three-dimensional view of the moon’s surface. It is the closest object in the night sky we observed, and is one of the most spectacular. With a list and a laptop loaded with stellar location data, the two astronomers went to work finding cool objects in their respective telescopes. The observatory has four total, one of which Baranski hooked up to a camera and recorded still images. Later that night, I did the same. Near the end of our three-hour session, I asked Merle what keeps him coming back to the observatory time after time, even on nights when it feels as cold as the dark side of the moon. After several breaks in a small area at the rear of the observatory warmed by space heaters, hebrought me back out for one last look through the telescope. I was hardly prepared for the amazing sight bursting too far away for the naked eye to see in its celestial brilliance — a cluster of bright stars that backlit a huge cloud of stellar dust. It was the Orion Nebula. In the end, all of the technical data about what a nebula is, how far the planets and stars are from Earth, how long it takes the light to travel to our eyes — none of that matters when you’re looking through a telescope. You’re just mesmerized by the mysterious show of light brought close by a device perfected by Galileo 400 years ago. And, you’re pulled into orbitary solidarity with astronomical enthusiasts, both past and present. With the first MAS public event scheduled in March, I vowed to return for another look, hopefully with my wife and four kids. The events are free and membership to MAS is only $28. That’s less than it would cost to take my family to any pro sporting event, and this would be like having season tickets. I think everyone should observe the heavens through a telescope like those at Onan at least once in a lifetime. This was only my second time. I would like to meet Father Brown again on a night when we are able to successfully see objects in the night sky with a telescope. I also would be curious to know: Can a priest say Mass inside an observatory? Dave Hrbacek is a staff photographer at The Catholic Spirit.